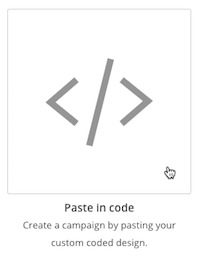 If you've already designed and coded an HTML email in another program, or received HTML from a designer, you can use the Paste in Code feature to create your campaign. In this article, you'll learn how to paste HTML code to create an email campaign. In your HTML code, all images must be hosted on a public server, and all links should be set as absolute paths that point directly to that public server. You can also use the Content Manager in your Mailchimp account to host your images and insert image URLs into your HTML code. To create a campaign with pasted HTML code, follow these steps. On the Template step, click the Code your own tab. Paste your HTML into the code editor, and click Save. Important CSS options and code snippets are also available in the code editor. To review optional settings, click the Settings tab. Check the Automatic CSS-Inliner box to help your code display more accurately in a variety of inboxes. Copy the unsubscribe link and paste it into your code. 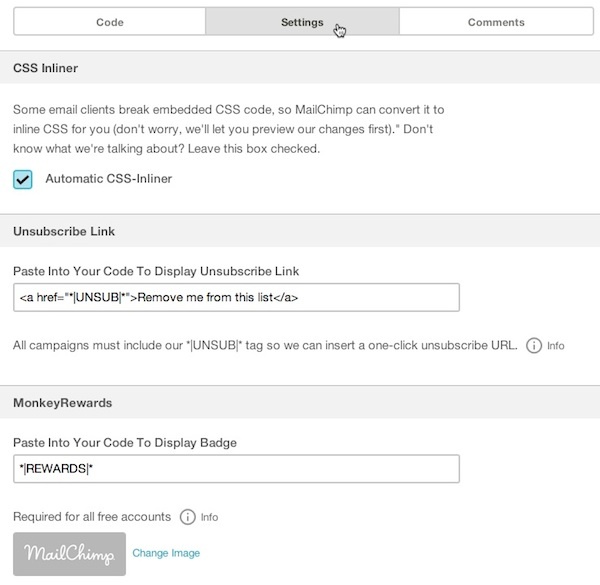 An unsubscribe link is required in all email campaigns. Copy the MonkeyRewards badge merge tag and paste it in your code where you want the badge to appear. The badge is required for free accounts. Click the Editor theme drop-down menu to change the appearance of the code editor. Learn about HTML email and get tips on how to design your HTML email.